Did you see that the new issue of Wool People has gone up? With Jared Flood at the helm, each issue has a cozy, slightly old-fashioned but still modern feel to it. This one doesn’t disappoint. My favourites include the sweater in the middle here and also the shrug to the left here. Check out the lookbook at the end of the announcement post to see the full collection. Understandably, all the designs use his own yarn but I think those two patterns I picked out would be just as lofty and snug in the Jamieson Shetland. 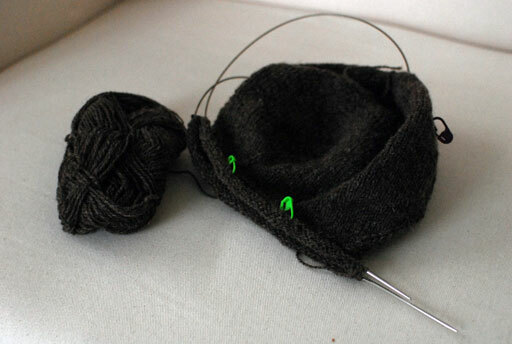 I’m pretty sure I will cast on for the sweater soon; I think it will make a great jumper for autumn. I can’t help but turn my thoughts to autumn knitting already! Even my sewing plans, whilst still firmly in the throes of several cotton projects, have started to expand to include some wool pinafores. A wool pinafore! With a light wool cardigan over a cotton blouse! Or a light wool tunic over jeans, tucked into boots, with a woolly jumper on top. This is my problem: my sewing and knitting unite now to give me endless options and it will probably be next summer before I complete anything! So, there are lots of things coming up. Don’t forget the Tour de Fleece is starting on Saturday! Check out letour.fr for all the stage details. I am quite sure there are many teams being organised through Ravelry – join up if you want some fun or just follow the threads if you need some inspiration. I won’t participate but I will certainly spin along to some of it. I have lots of Hedgehog Fibre and Laura Hogan fibre to keep me going. It’s great to see Laura back dying and spinning again! Her batts are like butter. And check out the Hedgehog site – Beata is going from strength to strength these days. She has moved into a proper studio that you can visit now. It’s definitely on my list for a road trip soon! I can’t remember if I mentioned it here before, but the Constant Knitter moved into a beautiful new premises on Francis Street. There’s a studio upstairs where they hold their classes, and they have expanded into selling fabric and teaching sewing classes, too. And speaking of new fabric outlets, The Cloth Shop has opened a new shop just at the top of Sth. William Street – they have one already in Limerick. They sell Colette patterns, as well as a really good mixture of dress and home decor fabrics. Oil cloth, many types of jersey, wools, cottons, and – something that pleased me especially with the closure of Trimmings – a good variety of different weight muslin. These range from light to medium canvas to heavy burlap. Excellent for making bags or mats and not easily found. I love This is Knit and Murphy Sheehy’s (and Rubanesque, and-and-and…) dearly but it is nice to have variety and choice. I read somewhere recently that everytime you spend money, you cast a vote for the kind of world you want to live in. I try and spread my pennies around to all of the local businesses that I love! Sorry for the lack of photos, I’ve been very busy lately. Hopefully today or by the weekend! 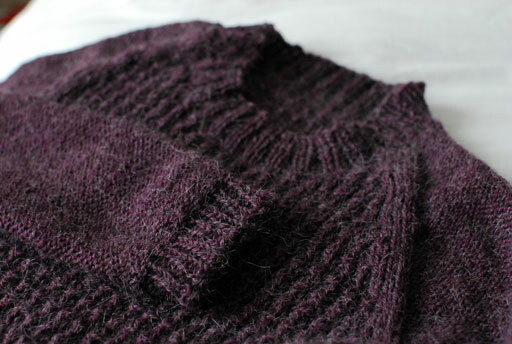 Spurred on by our chilly weather, I finished up my Bedford sweater at long last. Such is today’s gloom, modelled photos are unfortunately out of the question I can’t really complain though as I know other parts of the country have seen torrential rain whereas we have only had clouds. Grey, suffocating clouds but dry ones nonetheless. I was pottering about with the camera when I realised that I had never shown this shawl properly. 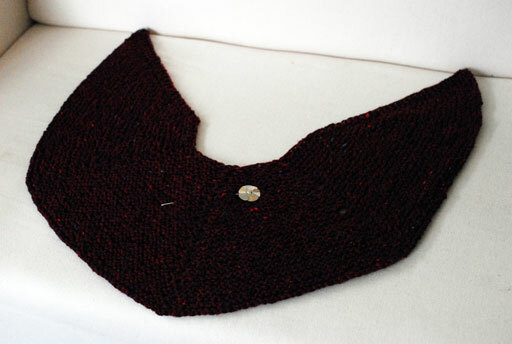 I don’t really remember when I knit this, though it must have been after Christmas. I knit a cream version for my teacher and liked it so much that I made one for myself afterwards. I used 1 skein of the delicious Studio Donegal Soft Merino (which you can peruse here) and something like 4.5mm needles. They were a bit small. I think 5.5mm would have resulted in a loftier fabric and a bigger shawl. That said, I love it dearly, wear it often and have another skein in the light blue for another on the bigger needles. You might spy the silver shawl pin there – it was a souvenir from Cafayate in Argentina, locally made by a lady silversmith. It was about €10. We were very picky about what we bought to put in our suitcases as we were travelling for nearly 5 weeks but this, I regret not one jot. Every time I use it, I think of the woman who made it, of our wonderful holiday and am reminded that here, we have absolutely no concept of what the middle of nowhere is. What else? Oh, I really wanted to try out the Jamieson and Smith Jumper Weight yarn that This is Knit has started carrying so I knit up a beret using my own pattern (Beret Easy… I’m feeling a bit old right now). Quick and easy, it was perfect for watching basketball during the week. All that remains is for the inner band to be sewn down. It’s a very nice yarn. A bit scratchy perhaps but I expect it will soften up a lot when I wash it. It is lovely and sticky, making it perfect for colourwork. Have you seen Kate Davies’ Sheep Carousel yet? I believe the digital pattern will go for sale in a few days. This is the point where I think we abandon all other notions and cast on for it immediately! I should probably explain why I haven’t been knitting in the last year or so – I have had tension problems with my left arm and shoulder. I am pretty much cured for now, which explains the recent surge in production! It was a combination of a number of things, such as sitting more for teaching, being stressed and playing a LOT from February to April. I had a number of days where I was sitting and playing for more than five hours (for competitions or rehearsals). Days where I sight-read a lot tend to leave me very stiff. Anyway, I started taking more breaks, stretching more, doing some yoga and just stopped working so much, and it’s healed by itself. I knit and spun very little because it aggravated it a lot: I am happy to be back to my old self. I really missed it and oddly, found myself not wanting to be interested because I wasn’t able to pursue it. Sewing is great but really, it’s not knitting! Speaking of which – you may have already heard about the big debacle concerning the Ravelympics? (If you don’t know about the Ravelympics, it’s basically a big worldwide knit/crochet/spin-a-long to the Olympics, with most communication going through Ravelry) Well, the commission for the US sent a cease and desist letter to Ravelry because the Ravelympics use the Olympics brand or logo or something. I don’t think they do exactly, but it’s enough to cause rancour. Not just that – by running such a harmless event, we are disrespecting what it stands for and the athletes that participate. I’m sure you can find out all the details on Ravelry. Whilst they probably do have some sort of legal point, I don’t really understand their point generally. It’s free, it doesn’t generate profit… mostly, it just stinks of one group of people saying, this other minor, insignificant group of hobbyists is not taking this seriously enough! they’re having FUN! you can’t have FUN at the Olympics! Also, isn’t the whole point of the Olympics to be inclusive, international and for-the-fun-of-participation? Well, whatever the outcome, I’ll be knitting along to the Olympics like I always do. I haven’t joined a team yet but I think I will participate in two events regardless: the frogging trampoline and the sweater triathlon. I’m going to rip out my Pole sweater and the sweater I want to knit is Amy Christoffer’s Larch cardigan. I have the yarn, I want the cardigan, I have marathons that need watching. And those races where they’re not outside the stadium but they go round and round and eventually they ring a bell and they all run faster? I love those. Regarding the Pole, I love it and adored knitting it, but I never wear it. I think it will live a happier life reincarnated as Heidi Kirrmaier’s Nanook. I will probably get sucked into the Sock Put and quite possibly the Hat Dash – and the Mitten Medley is far too tempting! What will I do! A month is not nearly long enough to decide! 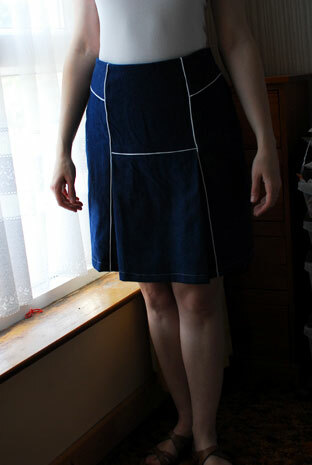 PS: Have also been sewing but too dark for modelled photos – the Lisette Market skirt (here), yet another pair of shorts but longer this time (here) and working on an Amy Butler top and a pencil skirt for my mum (here). I have been practising, too, I swear – there’s always time for the fun stuff. I scream, you scream, we all scream for french seams! I have made a few tops recently. In some of them I used french seams and in others I didn’t. 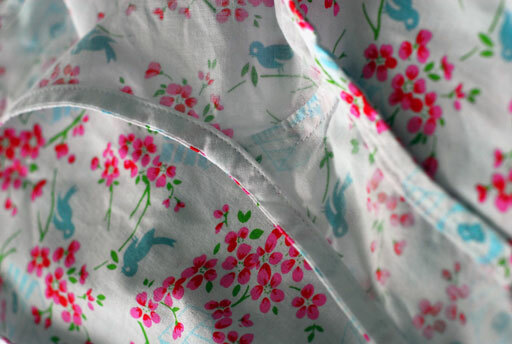 In the last Sorbetto I made, the instructions don’t say to french seam the side seams, but I did it anyway. The Wiksten tank pattern includes instructions for such a finish. The Violet pattern just instructs to ‘finish your seams’ after you’ve sewn them, at which point it is too late for a french seam. I wish I had considered this, and the kind of material I was working with, before moving on. Even though I zigzagged all of my edges on the widest setting, some of it has frayed a little and the zigzags are coming loose. 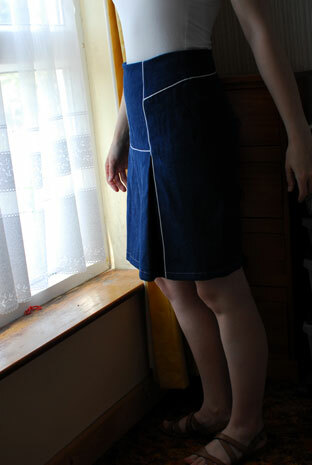 This is kind of disappointing but I think that until I make the leap to getting an overlocker, I need to consider using french seams more often. What do you think? 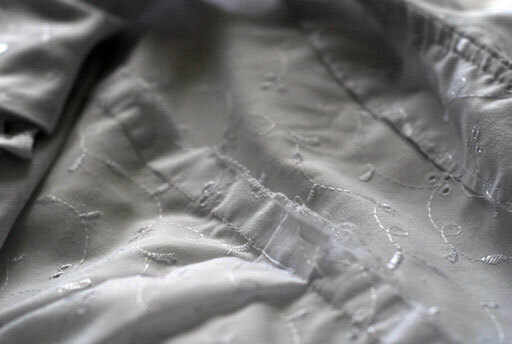 Are you afraid of french seams or do you use them all the time? Happy Friday! Today I have two tops to show you. The first is an oldie-but-a-goodie: another Sorbetto. 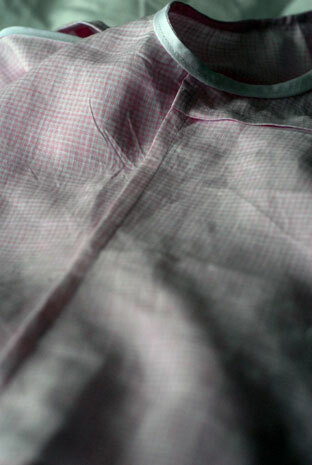 I had leftovers from my linen pink gingham skirt. Not enough, unfortunately, for another Wiksten, but definitely enough for this. Really, it was very straight forward. I shortened the dart by about 2cm and redrew it accordingly. I left out the pleat. 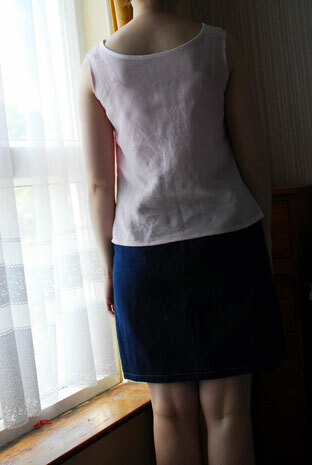 I sewed the bias tape so that it showed for the neckline but folded it inside for the armholes. The perfect, quick summer tank. I think it would be just a tad too matchy-matchy to wear with the skirt but it looks good with a dark bottoms (which I have many of). Spotlight of today goes to Violet. 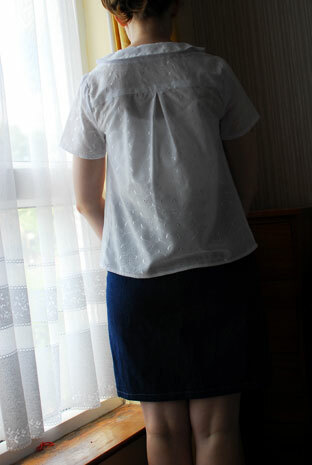 A Colette pattern that I wasn’t sold on until I saw a version sewn in a lovely eyelet. I came across something similar in Murphy Sheehy’s and decided to go for it. Pattern link is above; fabric was about €8 a metre and I think I bought 1.5m. I sewed a size 2, I think, perhaps a 4, even though my recommended size was a 6. I didn’t want anything too blousy. I pretty much made this as per the pattern except for two small things. 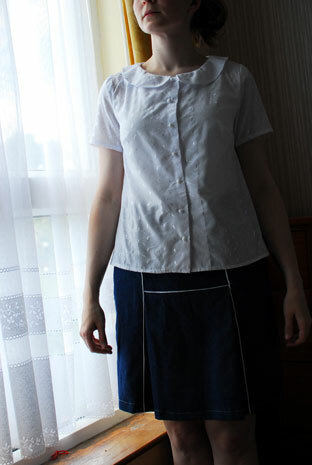 Firstly, in my insanity, I didn’t interface the collar. I think I figured it would be ok. It turned out a bit ripply. It looks like by itself but when worn with a cardigan, it is uncontrollable. Secondly, I didn’t do the gathers in the back. 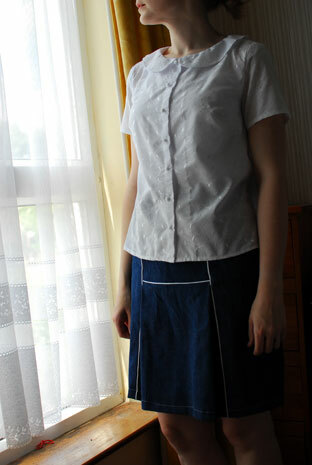 I made an inverted pleat instead. I just don’t like gathers. I don’t like making them, I don’t like sewing them and I don’t like how they look on me. Executive decision! I had a complete meltdown regarding the buttonholes. Inexplicably, they are horizontal holes. 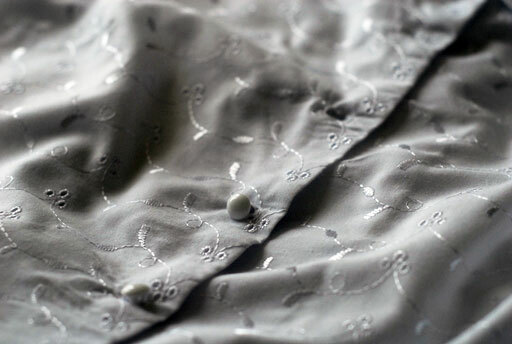 When I was making the hole, after the buttonhole stitching, the tack I’d made gave way and I ended up with a huge tear running from the button hole a good three inches across the front of the blouse. I’m not going to lie: there were tears. After a long time-out and a lot of encouragment from Alb, I mended it very carefully. Thanks to the nature of the fabric, my stitching was concealed pretty well so it’s not the end of the world. 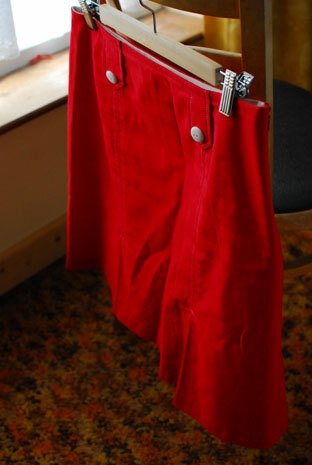 Buttons are smaller versions of the ones I used on my red blouse, from Rubanesque. Overall, the pattern is really good. Very clear with some nice finishing touches. I made a compromise cutting my size – it is a little snug under the arms but fits well every where else (I have very narrow shoulders). If this might be an issue for you, I would say go for the size recommended and you can always take it in if need be. Oh yeah – and just make a normal buttonhole! Thanks for looking and have a lovely weekend! 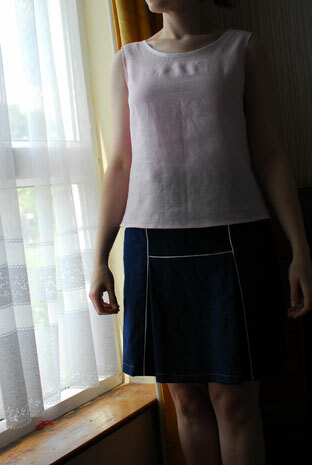 I wrote a while ago of how I made the alternative view of the Anna Maria Horner ‘Proper Attire’ skirt, and how it didn’t turn out as well as I’d hoped. The pleat sat very badly. Well, one day I finally got down to it and on the advice of my mum, took out the double-fold hem. Instead, I zig-zagged the edges of it and just folded it over once. I re-pressed it et voila! It seems to have done the trick. 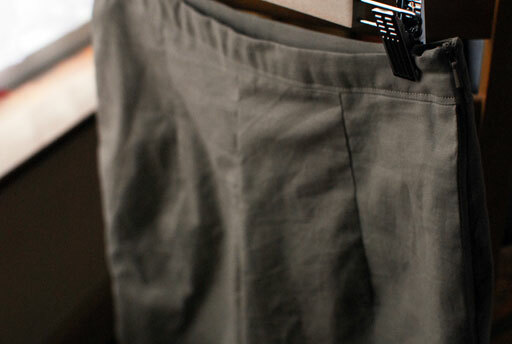 A little recap… the fabric was 2m of denim I bought at the K&S show (I also got these shorts out of it). I was happy that it maintained its inky colour after washing. This was my first project ever using piping but the instructions were extremely clear. It took me a session or two to simply piece the front together, though I think my patience paid off. As for the cord version I made, the darts at the back took a little tweaking. It’s just as well there is so much room at the front as the back is quite fitted. As you can see my piping doesn’t quite line up on the back yoke but it’s not a dealbreaker. This shows the pleasing outline given by the piping. 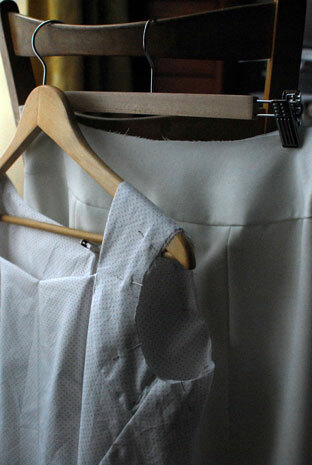 Maybe this view will help you imagine how crazy the pleat looked before – it stuck right out like a duck’s beak! I should say that this was entirely due to the fact that I sewed a heavy hem using a heavy material. If I’d used a quilting-weight cotton, as suggested in the pattern, I’m pretty certain it would have turned out fine first time around. All in all, I’m really happy with the result.